The Lowrance LHR-80U Handheld VHF has a built-in GPS receiver, distress call button and illuminated function keys for nighttime use. The LHR80 will work for communication and navigation. 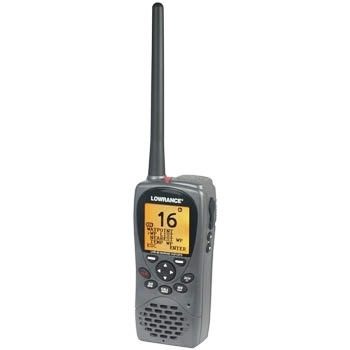 Each LHR-80 comes with: LHR-80 Handheld VHF, Rubber Antenna, Belt Clip, 110v Charging Cradle, Lio-Ion Battery Pack, Documentation and a Two-Year Warranty. Floating Design Is Waterproof To JIS-7 Standards. Storage For Up To 500 Waypoints. Built-In GPS Receiver With New Trackplotter Screen. Save A Buddy List Of Up To 20 People. NOAA Wx 1050Hz Tone Alert For Weather/Storm Warnings. 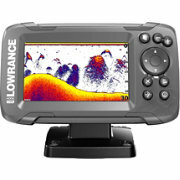 The Lowrance LHR-80 is an affordable yet full-featured floating VHF radio with a built-in GPS receiver. An easy to use VHF radio with the added convenience of a simple plotter, the LHR-80 is a must have for your navigational needs when used as your back up navigation system. A large 128×128 pixel LCD display with adjustable contrast settings and backlighting makes seeing the LHR-80 a breeze whether you’re in a dark area or in direct sunlight. The LHR-80 is a VHF first and comes with all of the features you have come to expect plus a few new ones. The 7.4v Li-Ion battery pack will operate the radio up to 10 hours on 5w power and 13 hours on 1w power. It even has power saver circuitry to save battery life and 4-bar battery life gauge. With all of the USA, Canadian and International Channels preloaded this unit is perfect for traveling around North America or further. Select 1kw or 5kw transmit power to help determine who can hear you and also view the incoming signal strength to get an idea of how far away people are from you. If you have favorite fishing spots or want to save specific locations, the LHR-80 will store up to 500 waypoints so you have everything right in the palm of your hand. 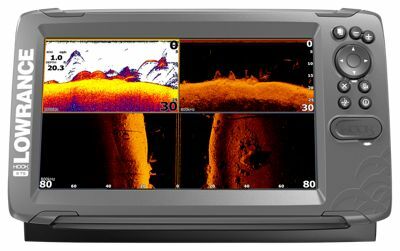 Lowrance also included enough storage space to save a buddy list of up to 20 people, that way all of your fishing partners are easily accessible at any time. A built-in GPS receiver allows you to turn your LHR-80 VHF radio into a handheld trackplotter so you can see where you have been and easily get back to where you started. Another bonus to having the GPS built-in is a DSC button on the unit for worst-case-scenario Distress Call. Having a NOAA Tone Alert for Weather/Storm warnings will always keep you one step ahead with your fishing plans. For the perfect handheld VHF radio, take the Lowrance LHR-80 on your next fishing or cruising adventure.